Posted in Books, Instruction, Pioneers, Products. Ever since Letty told us about her grandma Kate’s peach cobbler dripping with thick warmed cream, we were anxious to get the recipe and try it out. Though we didn’t have fresh cream from our own jersey cow, it was still incredible. 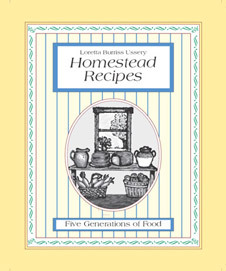 There are 159 recipes in this collection—family favorites from five generations starting with Letty’s great aunt, the Wagon Master’s daughter. Appetizers, preserves, salads, sauces and dressings, main dishes, side dishes, and lots of luscious desserts from exceptional cooks are spiced with comments and stories from across the generations. Stunning family photographs and Letty’s charming illustrations make this unusual cookbook a delightful gift.